What prompted you to join us and read IMPERFECT COURAGE? When you think of courage, what comes to your mind and heart? 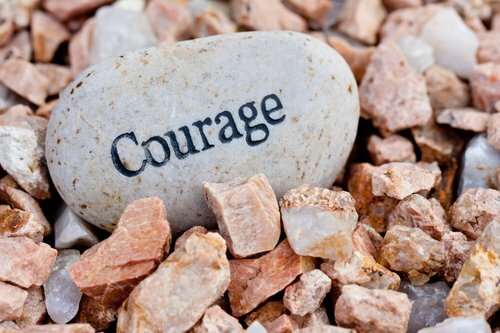 How do you currently describe courage? Is it an act, a feeling, a value, a friend, a muscle? If you’ve already begun reading, what resonates most with you in Jessica’s introduction? What do you want to take away from this book club experience? What do you want to contribute along the way? Take a moment now to close your eyes and ask yourself the very same questions Jessica asked herself as she began her IMPERFECT COURAGE adventure. Just write it down. Name it beyond the walls of your own heart as we begin this journey together. Sharing in the group is welcomed but not necessary. I simply invite you in our time together this fall to engage these two questions as you read. No action is needed; just live in the questions and listen to what they have to share with you. Where have you bubble-wrapped your life? Where do you step back rather than lean in? Name one area of your life you’d like to loosen the bubble-wrap on this fall. Write it down. Share it with a loved one or with this group if you feel so led. This is Jessica’s perspective on courage and her original motivation for writing this book. What is your perspective on courage? Can we create an impact without practicing our courage? What does impact mean to you? What impact do you want to make? The timing is never perfect, friends. What is nudging you? Write it down. What is one step you can take in response to this nudge? Feel what it will be like to follow this nudge. Feel it as if you’ve already done it. Go. Act. Take this step. Tell us about it in the Facebook group if you feel so led. We’ll cheer you on. What really stuck with you from this chapter? How does it apply to your own life? What is your ‘should’ story? And what is your ‘real’ story? Jot down what comes to your mind and heart as you consider the difference. What does stepping further into your story look like for you personally? Jessica speaks of ‘chilling out’ along the way. How can heed this advice in your own courageous life practice? Write your own version of a vision statement, just as Jessica did for Noonday Collection. Head over to our Facebook group and share a highlight of how you’re stepping into your story with us. What resonates most with you from Part I? What will stick with you? What would have made Part I even better? How will you integrate what you learned in Part I into your own life? I invite you to be specific. I also invite you to empower yourself to embed what you’re learning into your day-to-day in a clear way. Allow this book to be a nudge for action wherever you feel called to move, friend. part II DISCUSSION PROMPTS WILL DROP IN NOVEMBER IN ACCORDANCE TO OUR BOOK CLUB READING SCHEDULE.